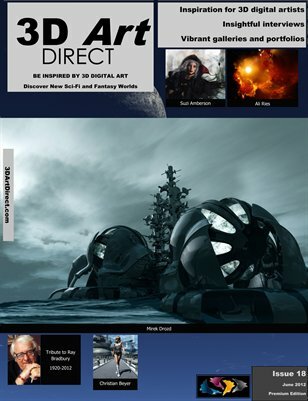 3D digital arts magazine with interviews and portfolios of digital artists from around the world. Editorial: Tribute to Ray Bradbury. Interviews with Ali Ries, Suzi Amberson, Mirek Drozd and Christian Beyer. Software covered by our artists:- Poser Pro 2012,Vue,Photoshop,Bryce,Truespace,Mojoworld,Nik Color Efx Pro 4,Diardsoftwares Universe and Hexagon.